The From The Screen To Your Stereo To Your Town Tour will include a very special stop in Franklin, TN for the second annual BreakFEST, a full day festival showcasing not only music, but the most important meal of the day – breakfast. Taking place on June 2, 2019, the event will be held inside The Factory. Bringing together both old and new friends in the music scene like Mae, Hawthorne Heights, Microwave, Jetty Bones, Love You Later, Doll Skin, H.A.R.D. 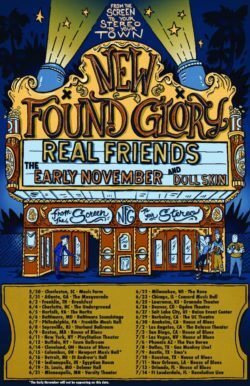 and tour mates Real Friends and The Early November, BreakFEST is just another way that New Found Glory continues to find unique ways to connect with their fans and their local communities. For more information, please go to http://breakfest.net/.